While the Nikkor 85mm f/2 chrome is relatively common, the same lens in black is very hard to find. The earlier chrome 85mm f/2 was a sales leader until the 105f/2.5 was introduced and sent 85mm f/2 sales into a tail spin. 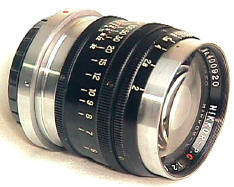 Towards the end of rangefinder production, the heavier chrome lens was replaced by the much lighter black 85mm f/2. This later lens is a real pleasure to shoot. It's a favorite of mine. The 85mm f/2 was one of the five original Nikon lenses, starting in 1948 with the Nikon One. 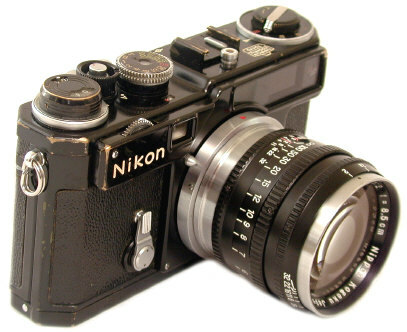 For years, until the introduction of the 105f/2.5 in late 1953, it was the ONLY Nikon portrait lens. 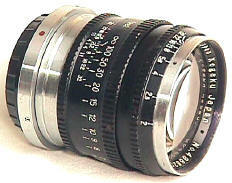 The 85mm f/2 was made in three mounts: Nikon, the very similar but different Contax mount, and Leica screw mount. 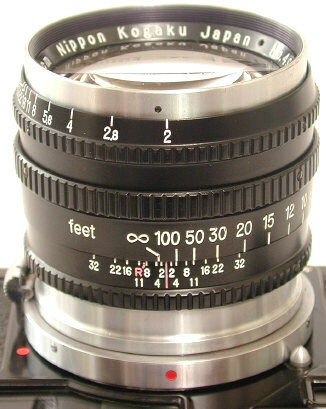 The Contax mount lenses look just like the Nikon mount, but have a large engraved "C" on the lens barrel. The chrome version is very well made, but very heavy. The earliest lenses are "MIOJ" or Made in Occupied Japan. They are so marked on the side of the lens barrel, or on the rear of the focusing cam. These markings, along with the earlier "Nippon Kogaku Tokyo" was later replaced with "Nippon Kogaku Japan" on the lens filter ring. 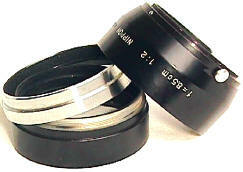 The large majority of 85mm f/2 rangefinder Nikkors were made in a heavy, well finished chrome mount. Two different black 85mm f/2's were produced towards the end of Nikon Rangefinder production. I've encountered only about one black lens out of 25 to 30 chrome ones. Of the black lenses, about 95% of them seem to be the later version. The first black version is VERY rare in any mount. Remember you can use even the earliest 1948 Leica mount 85mm f/2 lens on your new M6 just by adding a standard Leitz screw to bayonet adapter. The optical formula of the 85mm f/2 apparently remained the same throughout its life, a modified 85mm f/2 Zeiss Sonnar design. However, the later lenses do have a different and presumably improved coating. The 85mm f/2 enjoyed an excellent reputation as an outstanding lens. For years until the introduction of the 105f/2.5, it was THE portrait lens of the Nikon system. All 85mm f/2's rangefinder Nikkors have the same 48mm filter size and close focus distance, 3.5 feet. Like most Nikon rangefinder lenses, turn the lens and the body helical to infinity before mounting or dismounting lenses. About the time the SP was introduced in 1957, the 85mm f/2 was changed to a more "modern" black and chrome finish. There are two versions of the black 85mm f/2 Nikkor. They can be recognized by different barrel knurling designs. The first version is harder to find than the second. Shown above is the first version 85mm f/2 black on the left, the 2nd version on the right. The first version has noticeably finer barrel knurling. There are three basic 85mm f/2 shades in a number of variations. Shown are the chrome/black shade, split in two for filter placement, and the late snap on shade. Not shown is the all chrome shade for the earlier chrome 85mm f/2's. All 85mm f/2 shades, whether early or late, fit all 85mm f/2 RF Nikkors, regardless of version or mount. An all chrome screw in two piece shade. These earlier shades come apart to take Series VII filters. When stored in reversed position on the lens, 48 mm female screw in cap was used. The earlier ones are chrome, the later ones were black proclaiming "Nippon Kogaku Tokyo." The interesting thing is that since this was a female threaded cap, like the female threaded lens, the cap could only be used with the shade in reversed position. Since it doesn't fit the lens directly, many have been separated over the years from the lenses and occupy mystery positions in the proverbial camera store box. A chrome and black push on shade which unscrews to take Series VII filters. Push on cap which will not fit directly on the lens. The last and best snap on black shade, made especially for the black 85mm f/2. Since the snap on hood is rare, I suggest using the push on version or another manufacturer's shade rather than to risk losing it. This hood used the snap on 48 m lens cap when stored on the lens in reversed position, the same cap as the 35/1.8. Unfortunately, original caps are hard to find and easy to lose. I shoot with generic front caps for my Nikon Rangefinder outfit, to avoid the loss of hard to find original caps.